Esoteric student notes tell us in 2010, unqualified 20 year old Natalie Benhayon took up amateur social work to perform a Universal Medicine conversion on adolescents and teens – pestering them to disclose sexual and other indiscretions and offering them and their parents an ‘alternative’ to their errant behaviour and miserable ‘pranic’ lives – join her Dad’s shonky therapy, molestation and death cult. 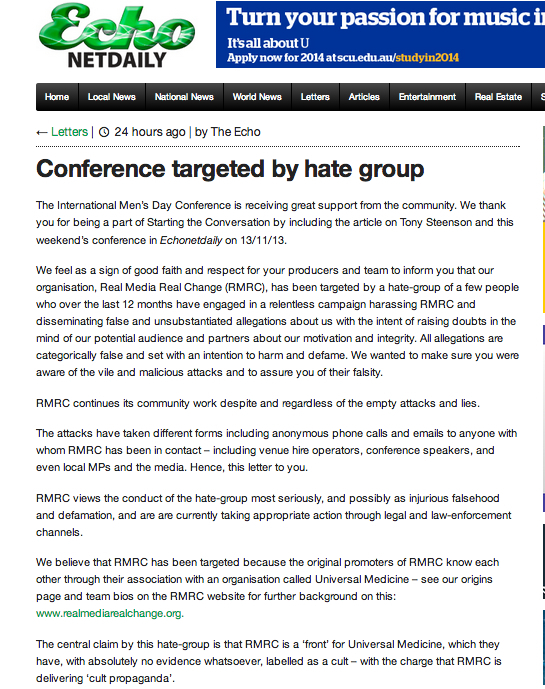 In an Esoterically explosive letter to the editor (now removed from the site) of the Byron Shire Echo, Real Media Real Change characterizes our exposure of facts about RMRC and our criticism of their deceptive publicity as an ‘attack’ by a ‘hate group’. They also say UM isn’t a cult, they’re not a cult front, they don’t deliver propaganda, and we’ve produced ‘absolutely no evidence whatsoever’. The same people call malnourished multi-millionaire genital palpater, Serge Benhayon, a man of ‘utmost integrity’ and ‘highly respected’. Whilst they fan their outrage smokescreen, they continue to evade our questions about their financial relationships with Universal Medicine, and their promotion of a sexual predator and his commerce in abuse.